I was happy to be hosted to experience this product. When applying a skincare product to your face, you take for granted that the ingredients will penetrate and do their thing. That's not necessarily the case! Serums are thin, highly concentrated forms of delivery for efficacious ingredients that aren't oily or waxy. They don't simply sit on skin as a barrier -- they sink in a few layers of epidermis. Similarly, peptides are amino acid chains that are smaller than protein chains. They also are more easily absorbed. G.M. 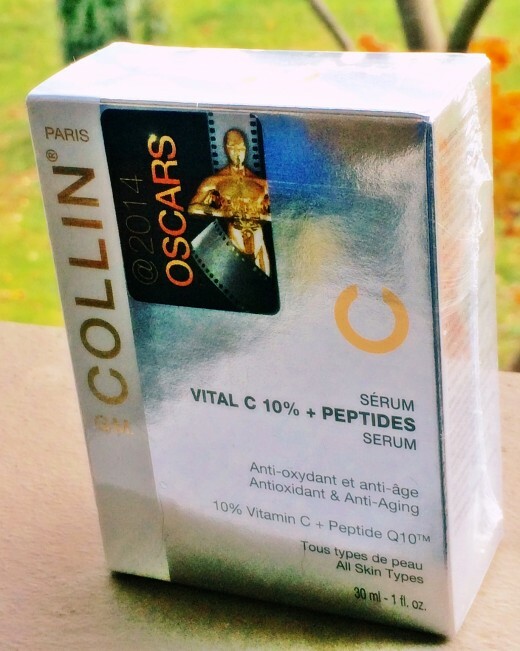 Collins Vital C 10% + Peptides serum is a water-weight and consistency fluid that pumps out of a sized for 3-1-1 carry-on travel bag/TSA compliant container. It has a faint citrus fruit scent. Unlike many Vitamin C skin products, it doesn't produce a red "rosy glow" rash. Many people can't tolerate the burning of strong Vitamin C products. Instead, your glow is more about hydration, than reaction. You should be able to apply makeup of any consistency right on top -- many serums are goopy and consequently, makeup pills over them. Serums are non-oily, which makes them unlikely to clog pores. Vital C leaves a smooth texture to skin after just a few days of use! It's so desirable, it was part of the 2014 Academy Award gift baskets/swag for presenters. Movie stars have their choice of any product in the world! So, that says a lot about the brand. You apply serums before any other skin care product. Though G.M. Collin has been a luxury skin care line since 1957, it's under the radar in the United States. First crafted in France and now based in Montreal, the brand was founded by a dermatologist and aesthetician who made many innovations for that era. For those surprised that the French created such products, let's not forget that it was they who blossomed under the Sun King, Louis XIV. From his court of Versailles, he kept rival aristocrats' wheels spinning in mud by forging competition in, basically, who can be the most beautiful of the "beautiful people". Luxury products and beauty care were never the same. Today, G. M. Collin is known for its scientific, high-tech formulas. Further, since the company's move to Montreal, the products have been reformulated to better suit the North American climate "and way of life". I'm not exactly sure what that means, other than perhaps a simplified regime -- the opposite of the 10-step "K-beauty" trend that probably is more hype than reality this side of the pond. Their products have won many awards by prestigious, high-end beauty magazines.